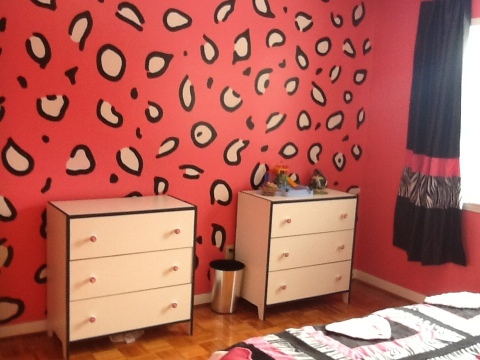 girls rooms | ARTZCOOL'S BLOG! What’s pink and black white all over? 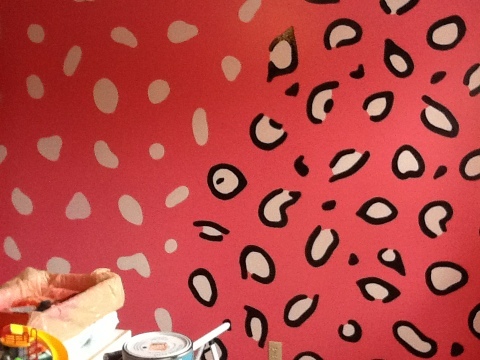 What’s pink and black and white all over… And is now finished? 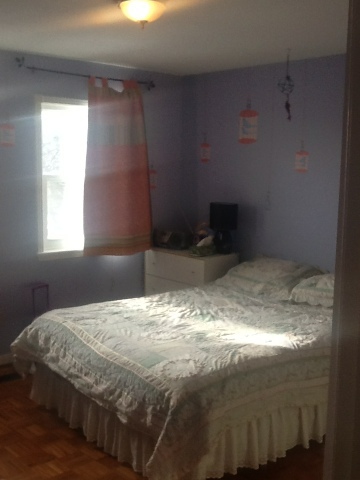 Samantha’s room!! Over the past couple of months, I have worked, and on my blog I have written about how we have made fake cupcakes, sewed a cupcake quilt, designed artwork, decorated mirrors, sewed curtains, dressed up her dresser, and painted pink leopard skin walls… All of which have been projects for my 7 year old daughter’s room. 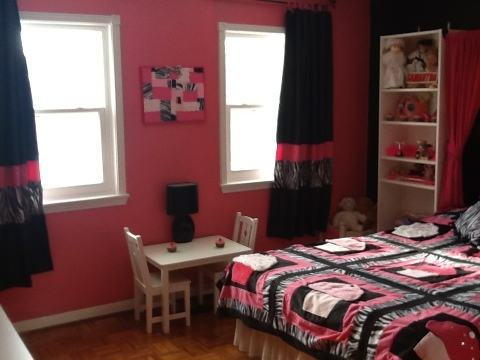 Here is what all of our projects look like put together in her room… I even actually hung the artwork! I might add a little trim to the top of her shelves, but other than that, it is pretty much done! I have a few ideas in mind before my next project, but I promised my husband I would wash out the paint trays and brushes first! For those of you who don’t know me, cleaning up after my creativity is not one of my strengths! By the way, happy valentine’s day! 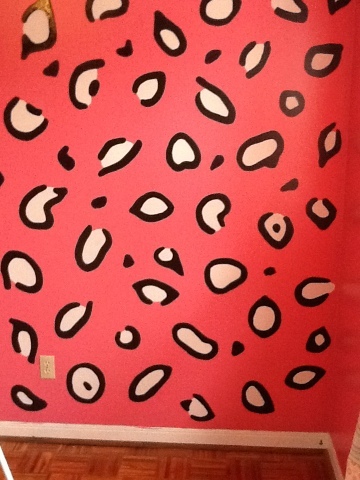 So, If you are interested in turning a wall of your house into a hot pink leopard skin pattern, then you are in the right place! But, for those of you who are not interested, the same techniques can be used with different colour schemes, on multiple surfaces, or projects. I have even painted a few serving dishes in leopard skin. 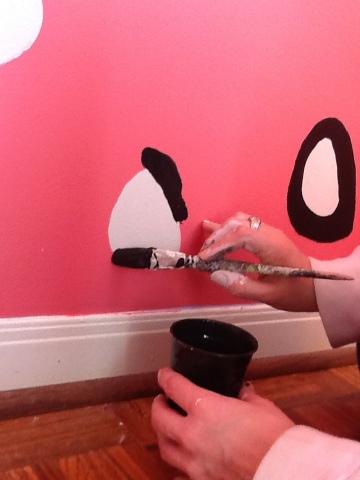 I started by using a plain white paint I had lying around (I actually used a primer). 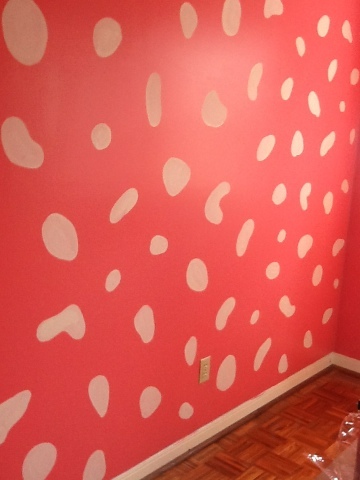 I randomly covered the walls with dots of different sizes and shapes. I could have used smaller dots, and put them closer together, but I wanted to keep the scale a little larger. I would also recommend taking a few steps back every few minutes. Where I saw gaps, or spaces, I added more black spots with paint. The first is to take the pins out as you sew. They get buried in the fur and lost, and trust me, they hurt! The second tip is to test your machine first to see if it can handle the thickness of fur together with a couple layers of fabric. I use my grandmothers antique Singer sewing machine because it can handle a lot of fabric. It only has one stitch, but it is my favorite machine right now! My third tip is to use a large stitch, and cover your stitching using a pin or seam ripper. 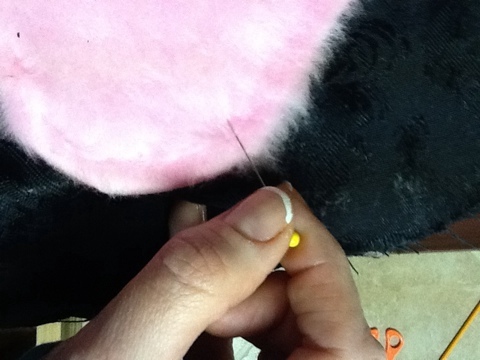 After you finish top stitching a seam in fur, your stitching leaves a line or part in the fur. If you use a bigger stitch length, you can use a pin to pull out a lot of the hairs that you have sewed down. If your stitch length is too small, it will be really difficult to pull the fur out. You can use the pin to pull the hairs out of all of your seams too, just use it kind of like a rake… I really have to figure out how to post using video! Hope this photo helps. If you look at the top of the photo, you can see where I have adjusted the fur. I think people normally sew quilts in an assembly line kind of way- sewing one seam at a time then repeating the same seam for all of the pieces, it just seems to make more sense. 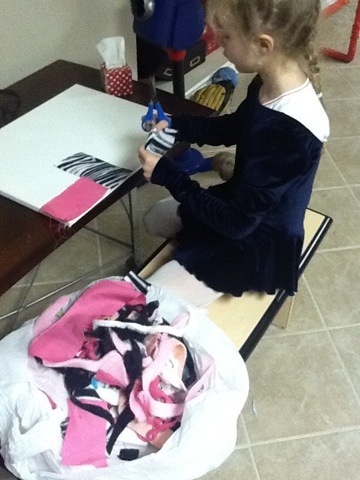 So I started by cutting a whole pile of pink and zebra skin strips, about 3 inches wide. 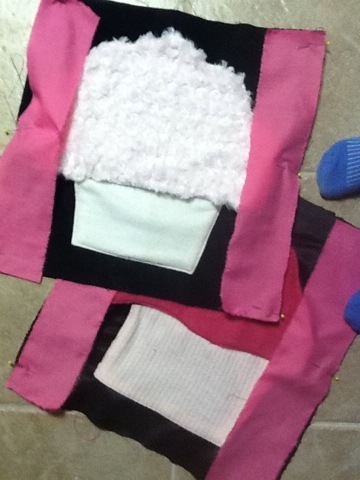 Then I pinned the pink strips to both sides of each block. 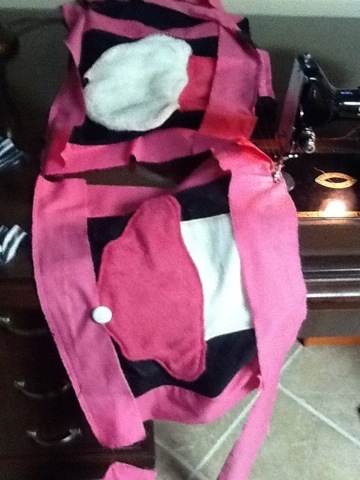 After all of the sides were sewn on, I attached the top and bottom pink fabric in the same way. As you can see, I sew in a continuous seam, almost connecting all of the blocks together. It saves a lot of thread and time stopping and starting. Also, when I am sewing is one of the only times you will see me with an iron, but it does make a difference in the finished product if you press open the seams before sewing the next ones. I will do the zebra borders the same way… This part isn’t my favourite to sew, It is pretty tedious, repetitive, and takes forever…. After the borders are all done, we will start sewing on the details. Everyone knows that a good cupcake has some decorations, so we decided to use buttons, and some sequins for some bling-bling. 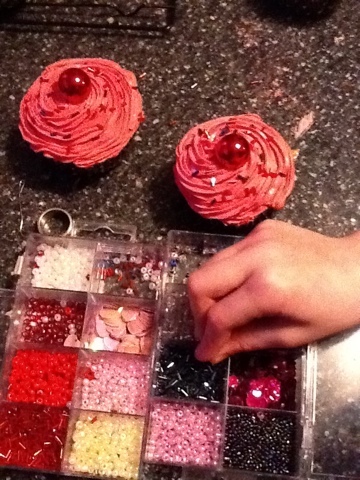 Because there are 12 cupcakes, I figured I would add about 4 sequins for each cupcake. Sam picked out all of the sequins she liked from the bag of sequins (apparently we can only use pink and silver), that kept her busy for a good half hour! 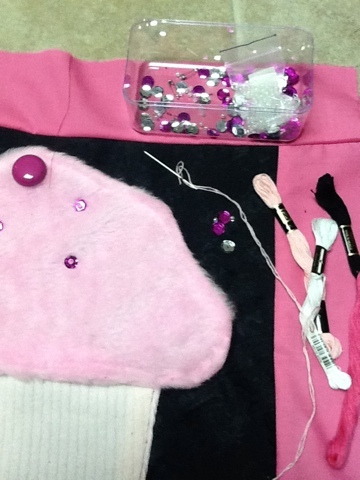 To sew on the sequins, I am using embroidery thread to save time. Because I am using three stands of the embroidery thread at a time, I only have to sew one time for each sequin because it is triple the threads. 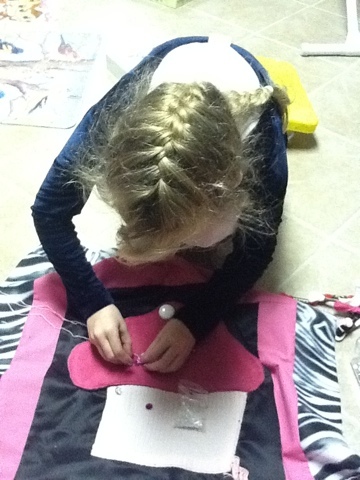 The kids helped sew on a couple sequins, but unfortunately, it didn’t keep their attention for long. I think it will take me a bit of time to finish all the zebra borders and sewing on the sequins, so I will post again when I am ready for the next step. Whew, Christmas and boxing day are all done, so now I have time for my next big project! 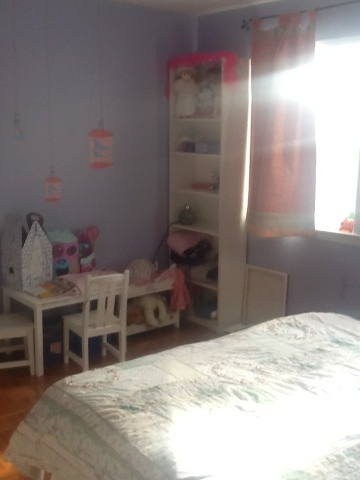 I am starting with my daughters room. 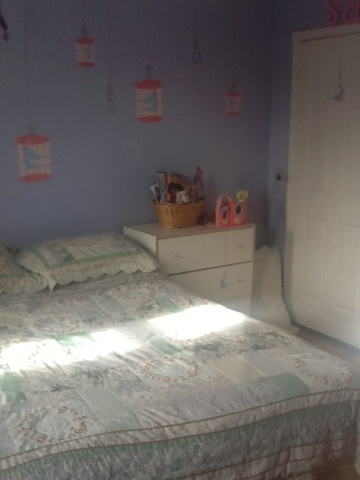 She is seven years old, and has decided that she would like a cupcake room, so I have been searching the Internet for the last two weeks looking for everything I can make that is cupcakes. 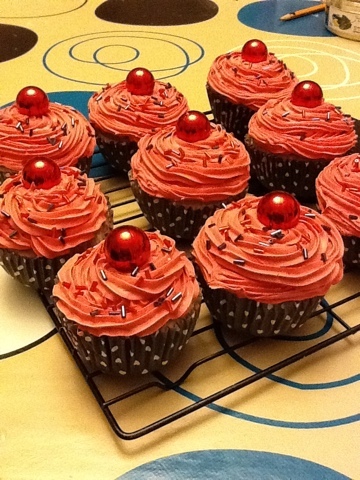 I found quite a few places that were selling fake cupcakes, but it took me some time to figure out how to actually make them! 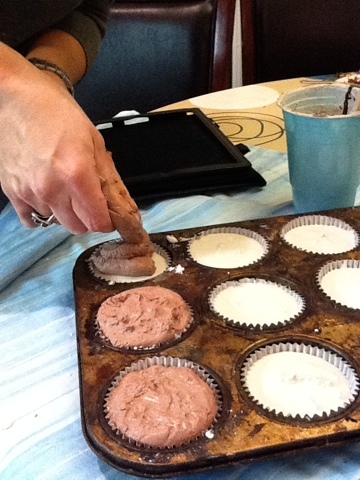 Here is how my daughter and I made these delicious looking cupcakes…. The first step is to make the actual cake part, or base, which is made out of plaster of paris. 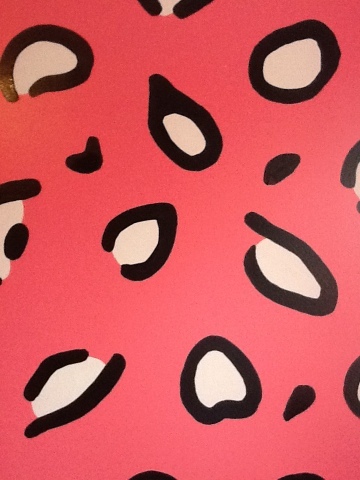 We started by finding a cute paper muffin cup which matched our decor…black and pink! 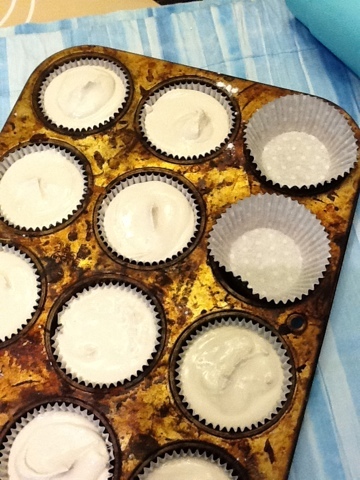 I used an old muffin pan, and some plastic cups to mix the plaster. 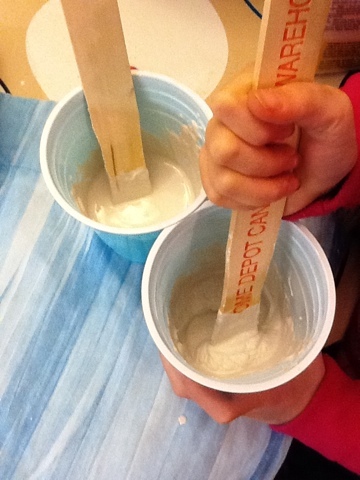 We mixed about a cup of plaster at a time, in several batches. I figured this would probably take more time, but be less messy(this considering the “help” I had from my daughter! The instructions say to use two parts of plaster with one part of water, but I ended up using a little more water. We then let them dry for two an a half days. If you feel the plaster and it is cold, it is still curing. It is best not to rush it at this stage. Be patient. We put them on top of a vent to dry. After a couple of days, we were ready to ice! 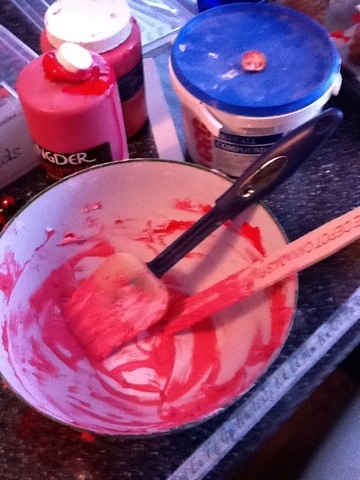 I used an old bowl, a paint stir stick, some tempera or acrylic paint, and an old piping bag and tip, and some drywall patching compound I had left over from the basement. We mixed the drywall compound or spackle together in a bowl, tried putting it in the piping bag, but it was way too thick. I made a huge mess and had to empty the bag, wash it and remix. I had to add quite of bit of water to make it thin enough to be piped. 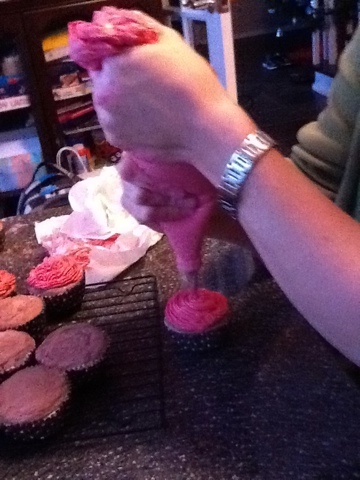 I found out the more “icing” you put on, the better the cupcake looks. I tried experimenting with different patterns, but I ended up icing them all in a simple swirl pattern. By the time I finished the twelfth one, I had the hang of it! 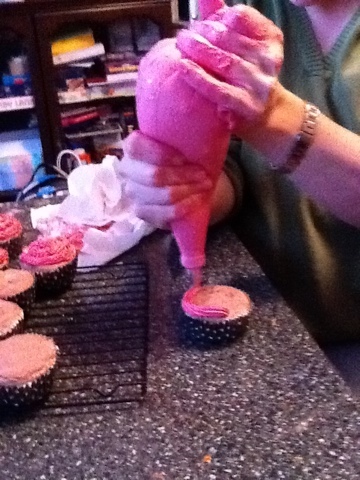 Decorating the cupcakes was the most fun step for my daughter. 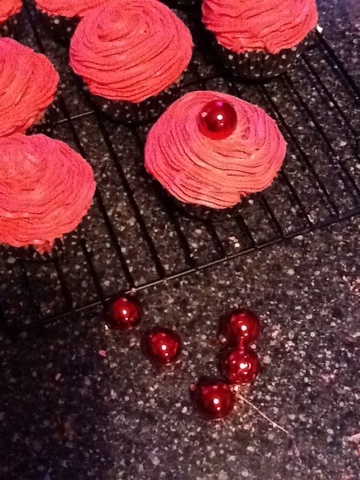 We used small christmas ornaments for the cherries on top and various beads for the sprinkles. I lightly tapped the beds to make sure they will not fall off. I think they turned out great! At this point, you could add a loop of wire if you wanted to use them as picture, or place card holders…I think they would be too heavy to hang. Also, after they dry, I am going to spray them with a quick coat of varnish to seal them. Let me know if you try this idea, I would love to hear your feedback!